I’m not really sure when my mom got the very first warning signs of Alzheimers, or when our family got the first clues. -She left school in the eighth grade to raise her four daughters and me her son, so she wasn't exactly school smart. That only made her more lovable to all of us, her lack of schooling, because it meant that she needed us as much as we needed her. 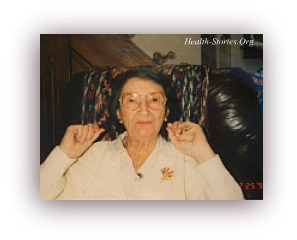 -It also made it a lot harder for us to recognize the early warning signs of Alzheimers in her. She didn't drive a car, had trouble with her checkbook in the best of times, and was always misplacing things. -When we first suspected Alzheimers, we'd call it "Alzheimer memoria demencias" (another name for Alzheimers) or just memoria demencias, so she wouldn't know what we meant. The fact that mom didn't get Alzheimers until she was in her early 80’s didn't help matters. Because of her age, we were all older as well, and our memories weren't exactly up to par either. Sometimes when the five of us were together, discussing a movie we had seen …. it was like playing charades. To watch us try to help each other remember a name of a particular movie or actress could really be quite comical. -How could we notice her memory loss when our own memories were failing? Like most people, we just chalked up her occasional forgetfulness to old age. I mean, she’d been on her own since our father died 20 years earlier. We could cut her some slack when she put her purse in the freezer, right? - Alzheimers disease is a physical disease that destroys brain cells, body functions and ultimately kills. - Some memory loss is a part of aging, the age dementia signs of Alzheimers are not a normal part of the aging process. - The warning signs of Alzheimers are not limited to the elderly. - Alzheimers is not currently curable, but there is hope. -1. Memory loss: Forgetting things sometimes is a normal part of aging. Alzheimers patients typically forget things that just happened and more often and can’t recall them later. -2. Struggle to perform familiar tasks: This is one of the easier warning signs of Alzheimers to recognize. An example would be the inability to remember how to make a sandwich or start a car. -4. Disorientation to time and place: People with the age dementia signs and symptoms of Alzheimers can get lost in their own neighborhood. They may walk right out the door and up the street, with no idea where they are, or where they’re going. -5. Decreased judgment: Putting on a bra on the outside of a shirt is one of the age dementia signs of Alzheimers. Leaving the house without shoes and giving away money are other signs of decreased judgment. -6. Problems with tasks involving abstract thinking: Things like balancing a checkbook can become overwhelming for Alzheimers patients. -7. Misplacing things: Leaving a purse in the freezer is a perfect example of an Alzheimer symptom. We all misplace keys, but for someone who’s coping with Alzheimers it’s a daily occurrence. -8. Changes in mood or behavior: Alzheimers can make people extremely moody. Alzheimers patients can swing from sad to angry and back again, with the flick of a switch -for no obvious reason. -9. Changes in personality: The personalities of people with the age dementia signs of Alzheimers can change dramatically. They can become very confused, suspicious, fearful or dependent on a family member. -10. Loss of initiative: Alzheimers patients can often be found staring at the television for hours on end. They stop going out, perhaps it’s due to fear, and they withdraw from society. -It is also very important to mention that it is possible for your loved one to exhibit some of the warning signs of Alzheimers or other age dementia signs or symptoms, and still have another, more treatable condition that may imitate Alzheimers disease. and could save a lot of heartache in the future. -Be suspicious if a new problem surfaces with the start of any new prescriptions, and contact your doctor immediately if necessary. Later as it progressed, coping with the dementia signs and the cognitive symptoms of Alzheimers became much more difficult for all of us to handle. She’d always enjoyed going for walks, but now when she did, she would forget how to get back. The last couple of times she did, we were so lucky our next-door neighbor saw her and drove her home. -We knew then that something needed to be done, that we would have to get her into day care and eventually into a nursing home for folks with Alzheimers. In the meantime the only thing we could think of to do, as we all had to work, was to lock her in my house and check in as often as we could until we could find her a placement. It was shortly after this that we were able to get her into an Alzheimers nursing home. It was very difficult at the beginning, as she did not want anything to do with it. She cried that first day we left her alone there, and so did we .....It broke our hearts. -On our next visit a few days later, we were relieved to find she loved her new home and didn't even want to go out with us. “Alzheimer memoria demencias” It had a firm hold of her. A woman once saw my three siblings and I walking with our mum, she knew and was quick to speak up: "Enjoy her now while you can". She quickly apologized, but it made us think and really appreciate her advice. -She was always very proud of her dark hair and how it stayed that way without treatment, (nearly till the day she died) and she was always sure to color her nails and apply lipstick daily. What we couldn't figure out was how she kept getting lipstick on her sleeves, and had terribly chapped lips all the time? -Another one of the warning signs of Alzheimers, it turns out she had been applying fingernail polish to her lips, and lipstick to her fingernails ….Alzheimer memoria demencias! Looking back, we really were very fortunate, so many people with Alzheimers can get angry or violent. -When we took her out to eat she would save her sugar packets, she'd even try to save her cream in an old pill bottle, if we weren’t paying attention. “Alzheimer memoria demencias!” It became our anthem, but not in a bad way, good old ma was always considerate right till the end, she kept us laughing with her antics, and believe me laughter is the best medicine. -As the Alzheimers continued to take her, she started having problems swallowing and they had to teach her how to again or she’d chew the same food over and over. A good part of the time towards the end, she didn't even know who we were but every now and again she’d get that twinkle in her eye, look at one of us and say ...“I know you!” and you knew, for that brief moment ....she did! Unfortunately by the time we recognized the warning signs of Alzheimers, our mom was already in the fourth stage and well on her way to mid-stage Alzheimers. -Still, we brushed aside her memory lapses and quirky behavior. They weren't so unusual. Alzheimers didn’t run in our family and my mother had always been a very healthy woman - it never occurred to us that she could have a problem. -I guess we were all still in denial of the Alzheimers diagnosis. My family can tell you from experience, it is so much better to be informed. -Forewarned is forearmed, right? Alzheimers is the 6th leading cause of death in the United States. Nearly 10 million Americans are caring for a person with the age dementia signs of Alzheimers, and there is a wealth of information and support available. In addition to the information your local hospital or health care center will likely have, there's an abundance of information and support online. My mother, like so many others, dealt with heart disease and Alzheimers and eventually succumbed to heart related problems. -Late onset Alzheimers can be different for everyone. How fast it progresses, what Alzheimers medications work to help, with both the cognitive and behavioral symptoms, and even what warning signs of Alzheimers may appear in different people. -If your loved ones are approaching old age, arming yourself with knowledge about the early warning signs of Alzheimers is the best first step you can take for yourself and your loved ones. Learn from our mistake and recognize the warning signs of Alzheimers disease early and take your loved one to a physician to be diagnosed. ....Don’t wait until the Alzheimers symptoms are undeniable!